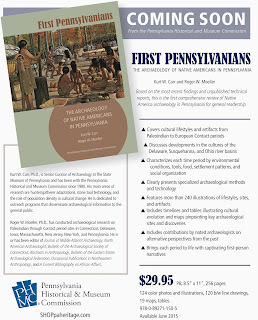 This week our blog is announcing the publication of a new book on Pennsylvania archaeology. 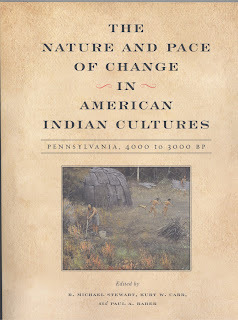 The Nature and Pace of Change in American Indian Cultures: Pennsylvania 4000 to 3000 BP. is the first in-depth synthesis of the Transitional period in decades. Three thousand to four thousand years ago, the Native Americans of the mid-Atlantic region experienced a groundswell of cultural innovation. This remarkable era, known as the Transitional period, saw the advent of broad-bladed bifaces, cache blades, ceramics, steatite bowls, and sustained trade, among other ingenious and novel objects and behaviors. 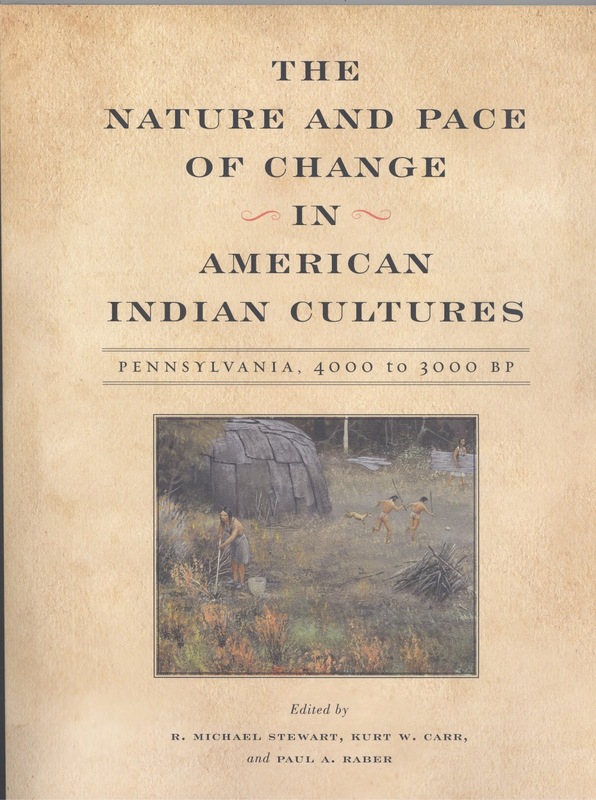 In The Nature and Pace of Change in American Indian Cultures, nine expert contributors examine the Transitional period in Pennsylvania and posit potential explanations of the significant changes in social and cultural life at that time. 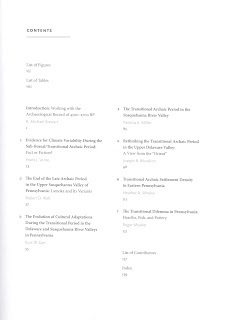 The Introduction by R. Michael Stewart summarizes each of the chapters. Population density is a common theme and Stewart does an excellent job of analyzing this issue and its potential role in the development of the Transitional period. He concludes with a discussion of the major trends - environment, technology, subsistence, settlement patterns, social organization – and examines possible explanations for their occurrence. In Chapter 1, Frank Vento sets the Paleoenvironmental stage for this period. 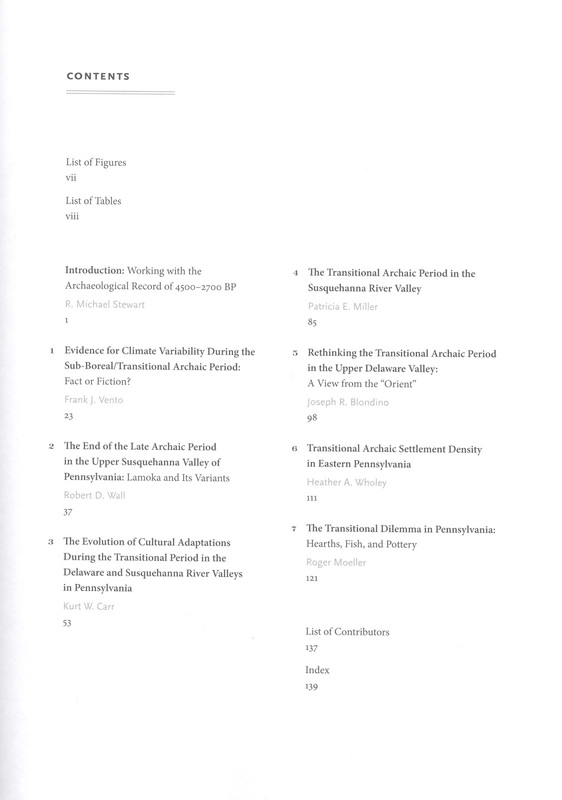 The Transitional period generally corresponds to the warm and dry Sub-Boreal climatic episode and Vento spends some time addressing the issue of “how dry was it?” Robert Wall, in Chapter 2 reviews the Late Archaic developments that preceed the Transitional period in the Susquehanna Valley. 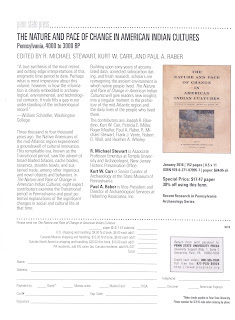 Kurt Carr reviews the Transitional period in the Delaware and Susquehanna valleys in Chapter 3 and argues that population pressure and minor changes in the environment resulted in a new adaptive strategy. In contrast, Patricia Miller in Chapter 4 synthesizes this period in the Susquehanna Valley and argues that population pressure and a developing trade network are responsible for the changes during this period. Joseph Blondino, in Chapter 5, reviews what is considered the end of the Transitional period in the Upper Delaware Valley, the Fishtail phase. He offers explanations for the frequent use of floodplain settings during this time. Heather Wholey examines population differences in Chapter 6, and identifies differences in site clusters in the Susquehanna and Delaware Valleys. Finally, in Chapter 7, Roger Moeller critiques many concepts typically associated with the Transitional period. This book contains 56 figures and tables. 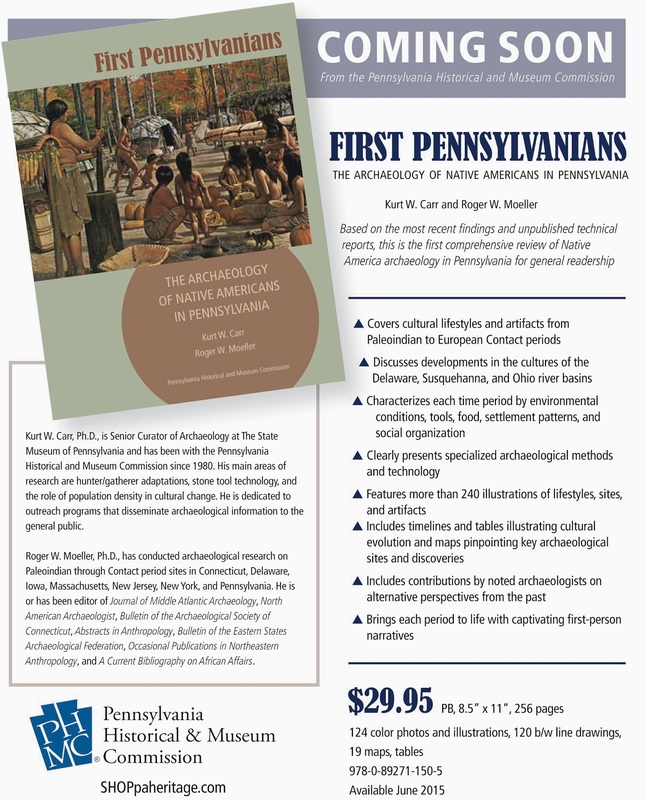 They are in black and white but we suggest that you purchase First Pennsylvanians: the Archaeology of Native Americans in Pennsylvania where many of these artifacts are illustrated in color. 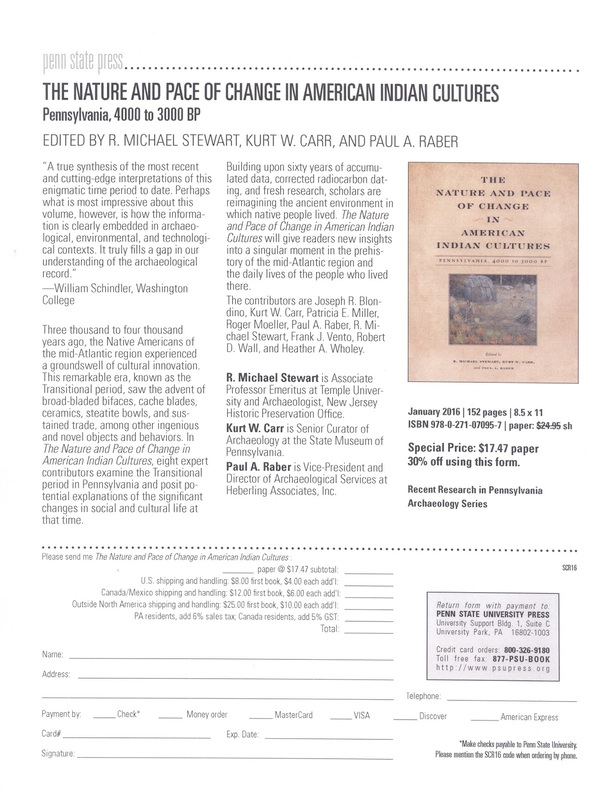 Nature and Pace can be purchased from the Pennsylvania State University Press. 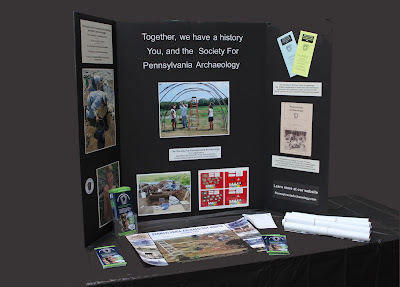 The form below offers a substantial discount and the First Pennsylvanians can be purchased on line at SHOPpaheritage.com or the State Museum Bookstore in Harrisburg. If you are interested in actually seeing artifacts from the Transitional, visit the Hall of Anthropology and Archaeology at The State Museum of Pennsylvania in Harrisburg. This year commemorates 100 years of the annual Pennsylvania Farm Show. According to the Farm Show web site it is the “largest indoor agricultural exposition in the nation, with nearly 6,000 animals, 10,000 competitive exhibits and 300 commercial exhibits.” Of course, the Section of Archaeology at The State Museum of Pennsylvania is one of those exhibits, complete with an authentic replica of a 20 foot dugout canoe. 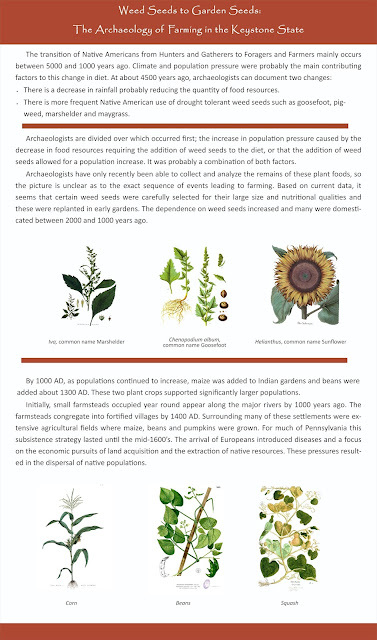 Our exhibit features the origins of farming and is entitled Foragers to Farmers, the development of Agriculture in Pennsylvania. Farming is more labor intensive than hunting and gathering and there is a debate in archaeology as to why early Indian populations in Pennsylvania gradually began focusing on seed plants such as goosefoot, lambs quarter and maygrass for food; eventually growing these plants in gardens and finally adding maize to their diet. The dependence on maize in the diet by about A.D. 1200 corresponded to the development of large villages and significant changes in social organization. 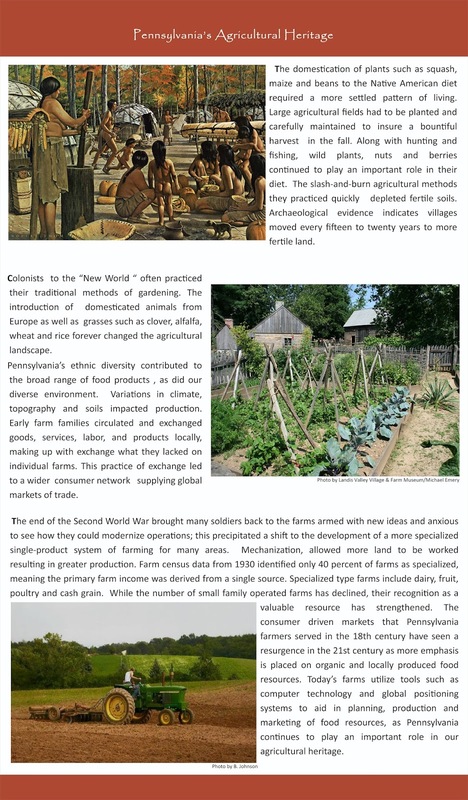 During the 1700s, European farms began to dominate the region and farming change to include livestock and grains. By the late 19th and early 20th century, farming became more mechanized and fed huge numbers of people. The artifacts on display document this change over the past 5000 years. An addition to this year’s exhibit is a stone mortar and pestle which are being used to demonstrate corn grinding. Corn quickly becomes a food staple after A.D. 1200 spurring dramatic social changes. Small egalitarian groups of people grew tribal societies. This is an excellent opportunity for us to connect with the community. We talk to an average of 40-50,000 visitors each year at the Farm Show and are able to share our knowledge with interested citizens of the Commonwealth. One of our goals in reaching out to the community is to share the significance of archaeology and the importance of recording archaeological sites. The Pennsylvania Historical and Museum Commission is the State Agency for preserving our historical and archaeological heritage. The State Historic Preservation Office (SHIPO) records and maintains the files to all known sites across the commonwealth. This database of information enables state agencies such as PENNDOT to plan for highway projects that will have the least amount of impact on archaeological resources. Archaeology is an expensive undertaking and avoiding those sites reduces the expense of building a road or bridge. As a result of our interactions this year, we received information on the discovery of a Paleoindian projectile point from Berks County and another individual shared a grooved axe with our archaeologists. Both of these individuals were able to provide site discovery location which is crucial to our understanding of past human behavior and settlement patterns. We hope you will continue to share these finds with our staff either at the Farm Show or at our offices in the museum. As you may have noticed, our location has changed from past years. Although still in the Main exhibit hall we are no longer near the entrance to the Small Arena but next to the Maclay Street Lobby across from the carousal. Many people have commented on the change as an improvement so hopefully you will all be able to find us. The Farm Show runs through 5:00 p.m. Saturday, January 16th. So there is still plenty of time for your annual “ride” in the dugout.